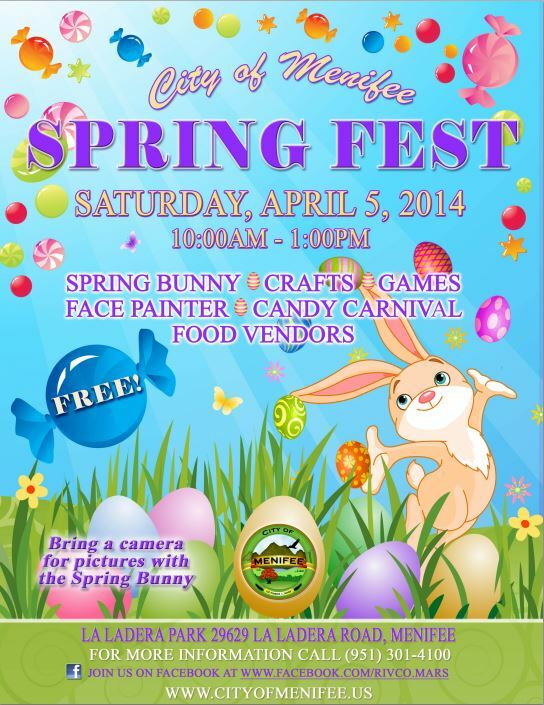 The City of Menifee will celebrate the change of seasons with Spring Fest on Saturday, April 5th from 10 a.m. to 1 p.m. at La Ladera Park. Perfect for the entire family, attendees are invited to come enjoy crafts, games, a candy carnival and a variety of food vendors. Visitors should bring a camera to take their picture with the Spring Bunny. The event is free to attend. For additional information, please visit cityofmenifee.us or call 951-301-4100.